We updated the system today with several performance and reliability improvements. First, we changed the way viewers download meshes from Kitely to make mesh downloads faster. This means that worlds that use many meshes should render faster in viewers, while exhibiting less lag. Next, we upgraded from Mono 3.2.3 to Mono 3.4.0. (Mono is part of the system software that runs Opensim.) The new version of Mono includes numerous bug-fixes and performance improvements. Finally, we now allow using the character “+” in email addresses when signing up to Kitely. This is useful in some cases, e.g. when an educator uses gmail sub-email accounts to create Kitely accounts for his or her students without needing to manage multiple email accounts. We’re announcing a change to how Metered Worlds work, and we’re naming this new option Premium Worlds. If you’re a Regular Account user who has Metered Worlds in your account then make sure to read this blog post. UPDATE, June 19 2014: due to some misunderstandings, we want to clarify that the changes described below only affect world managers. Users who visit Kitely worlds never have to pay, regardless of their account type, and this hasn’t changed. Fixed-Price Worlds – the world manager pays a fixed cost per month (starting at $14.95), and then never has to pay anything more to use the world. In particular, the world manager doesn’t need to pay when users visit the world. The change that we’re announcing today is that from now on only users with a Premium Account will be able to create Premium Worlds. That’s the reason that we renamed them (from “Metered Worlds”): to emphasize that having Premium Worlds is a benefit that is reserved for users with Premium Accounts. Despite this change, there are still ways that users with a Regular Account can end up with a Premium World. E.g., if they created the world while they had a Premium Account, but later they downgraded to a Regular Account. In such cases we don’t delete the worlds: they remain in the users’ accounts. However, only users with a Premium Account will be able to visit them: Regular Account and Hypergrid users will be prevented from visiting a Premium World that belongs to a user with a Regular Account. Note that this includes the world manager herself. A: Premium Worlds are an insanely good deal, which no-one but Kitely offers because only a company that automatically provisions cloud computing resources like we do can afford to provide so many virtual worlds for such a low price. However, it turns out that the deal was a little too insane on our part, as our profits on Metered Worlds are measured in cents per active user-hour. This would have been sufficient if we had tens of thousands of active users, but we don’t, and so the clear preference of Regular Account users to use Metered Worlds instead of Fixed-Price Worlds deprived us of the revenue that we need to grow the company. By requiring a Premium Account in order to create Premium Worlds we will receive some recurring revenue from each active Kitely world owner, thus improving our financial standing and long-term viability. Even after this change Premium Worlds are still by far the cheapest way to get many virtual worlds, since you can get 5 full-size regions with 100,000 prims each for just $19.95 / month (plus a few KC when Regular Account and Hypergrid users visit these worlds). A: If you only visit other people’s worlds, but don’t own your own worlds, then this change doesn’t affect you at all. The rest of this FAQ is only relevant for world managers. If you have a Premium Account then this change doesn’t affect you either (even if you do manage your own worlds). If you have a Regular Account but your worlds are all Fixed-Price Worlds then this change will be barely noticeable. The only change you’ll feel is if you Copy one of your worlds, because the new copy is always a Premium World, and as a Regular Account user you won’t be able to visit it. But the copied world can still serve as a snapshot of the state of your world, and you can Export it, or change it to a Fixed-Price World later. If you have a Regular Account and you own any Premium Worlds then you will no longer be able to visit your worlds, nor allow other users to visit them (except for users with a Premium Account). See the next question for what you should do. Q: I have a Regular Account, and I own some Premium Worlds. What are my options? A: Your first option is to upgrade to a Premium Account ($19.95 / month). This will allow you to create Premium Worlds, and to permit Regular Account and Hypergrid users to visit your Premium Worlds. A Premium Account includes 5 free premium regions, so whatever you’re currently paying for world storage fees (10 KC / region / month) will probably be lower. A Premium Account will also allow you to visit your worlds for free (currently you pay 1 KC / minute for the time you spend in your worlds). And finally, a Premium Account lets you visit virtual worlds that are only open to users with a Premium Account (this is a common access restriction). Your second option is to change your worlds to be Fixed-Price Worlds. E.g., a Starter World costs $14.95 / month. This will allow both yourself and anyone else to visit the world without costing you anything. If you choose this option then you can remain on the Regular Account. And finally, you can choose to do nothing. We will not delete your Premium Worlds: they’ll remain in your account (as long as you pay the storage fees of 10 KC / region / month). However, since you have a Regular Account you will not be able to visit them – only users with a Premium Account will be able to visit these worlds. Q: Does Kitely still provide a free trial period to new users who want to create a world? A: Yes, if you’re a new user then you still get a free 1-region Premium World that will remain in your account indefinitely. We also give you 6 free hours in-world to try out your world. The free trial period allows you to visit your Premium World even though you have a Regular Account. However, this doesn’t extend to other users, so other users can only visit this world if they have a Premium Account. In addition, once the trial period ends you will not be able to visit your world anymore. If you upgrade to a Premium Account then you’ll be able to continue visiting your world, as well as allowing other users (not just users with a Premium Account) to visit it. Please note that we don’t require you to give us your billing information in order to get this free trial period. A: Users with a Regular Account can’t create new Premium Worlds: this change is effective immediately. However, users with a Regular Account that have existing Premium Worlds in their account have a grace period until July 1, 2014. 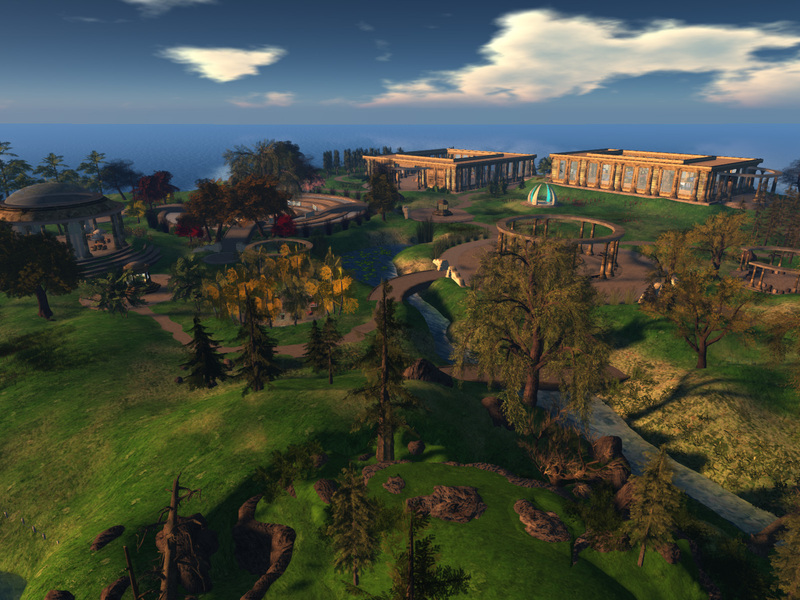 During this grace period, Regular Account and Hypergrid users will still be allowed to visit these worlds. On July 1 the full rules described above will take effect, so Regular Account and Hypergrid users will no longer be able to visit these worlds. We’re happy to announce that we rolled out a new and improved version of the Kitely Welcome Center. This updated version of the main entry point to our grid is more visually impressive and includes more interactive elements that help visitors understand our service. Visitors to this virtual world can now find various dynamically-updated objects that will direct them to the content, locations and events that may interest them in Kitely. Paislee Myrtle: was responsible for redevelopment of various areas, landscaping, replanting, information and avatar kiosk models, new secret area. Dundridge Dreadlow: created information and event board models, event system and scripting, Kitely Portal for featured worlds, continued work on showcase world boards, and other general awesomeness. Dot Matrix: is the ongoing project coordinator and also expanded the Community Meeting area. Min Tigerpaw: scripted menus for seating areas. Chav Paderborn: updated skins for avatar area. oopsee joseppe: updated clothes for avatar area. Deuce Halsey: contributed a crate of new tee-shirts and tops for the avatar area. Marstol Nitely: worked on photography and testing. Handy Low and Selby Evans: created a Google calendar for Kitely events. The refreshed landscaping includes new items that were bought in Kitely Market from the following stores: 21strom, Worlds End Landscaping & Roleplay, Heart Botanicals and Brayla Sana Gallery. It also includes plants by Selea Core from the Hypergrid. We want to give special thanks, yet again, to Dot Matrix who has been organizing this community project for many months now. She’s been doing a phenomenal job of getting everything and everyone in order and there would not have been a Kitely Welcome Center without her ongoing dedication and coordinating skills. Thank you all past and current contributors who’ve helped build this wonderful virtual world. We welcome everyone to come and visit! We updated the system today with several improvements and bug fixes. We also made progress in our branding project, with a new homepage that is much more professional-looking than before. 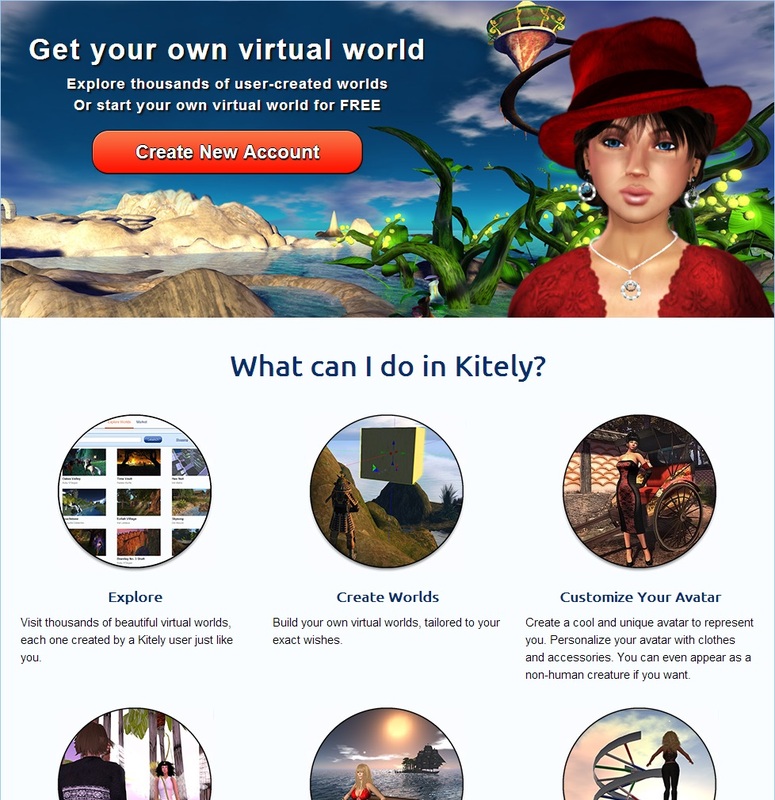 The new homepage explains what Kitely does in a way that even users who don’t already know virtual worlds can understand. It includes many screenshots, and we’d like to thank all the Kitely users who donated their time and creativity to help us create these images. For a world manager, when you view your account history to see who has visited your world, we now show the profile pictures of Hypergrid users. When you buy products from Kitely Market for delivery to another grid, you are now allowed to review these products. Previously only the user who received the products could review them, but this was useless for Hypergrid deliveries since the receiving user isn’t a Kitely user (by definition), so they can’t login in order to review the products. For users with many items in their Wish List, only the first 12 items were shown. We added paging buttons that allow you to view all the items in the Wish List. You can now use the “Home” command (Ctrl-Shift-H) while in a foreign grid in order to return to Kitely. If you haven’t defined a Home location then you’ll be teleported to the Kitely Welcome Center. We fixed a problem where in some cases, when you took an object in a foreign grid and brought it back to Kitely, the item turned out to be non-Exportable. This happened if the item didn’t have Copy+Transfer (CT) permissions. But it was a silly restriction since the item had started out its life in a different grid, so there’s no point in keeping it from leaving Kitely. To solve this, we now flag items that came from a foreign grid as being “foreign”, which means that they’re allowed to be Exported even if they don’t have CT permissions. Note that this change doesn’t affect items that are created in Kitely (including items that enter Kitely using Upload OAR, when creating or replacing a world). We fixed a certain peculiarity in the World Map. It’s possible to type in the name of a region in the World Map, and then teleport to that region. But there are two formats for entering region names: for regions in the current grid you’re supposed to enter only the name of the region (e.g., “Kitely Welcome Center”), whereas for regions in other grids you need to enter their full Hypergrid address (e.g., “grid.kitely.com:8002:Kitely Welcome Center”). If you tried to enter the Hypergrid address while in Kitely then the map would fail to find the region. This is a problem because our World Pages show the Hypergrid address of worlds, so it’s natural for users to try to enter it into the World Map. We fixed it so it’s now possible to enter the Hypergrid address of a Kitely world even while you’re in Kitely, and the World Map will find the region and let you teleport to it. We fixed a bug that prevented Export World from working in worlds with many prims. This is a recent bug; it was introduced during the big Hypergrid update. If you’ve tried to export your world and failed then please try again now; it should work. We fixed a bug where very large deliveries from Kitely Market to foreign grids could fail. There was a certain limit in place, which we’ve now greatly increased. We fixed a permissions bug: an object’s Next Owner permissions ignored the permissions of the items inside the object. For example, suppose you rez a box, set its Next Owner permissions to “CT”, and then place inside it an item whose Next Owner permissions are just “C”. Then, you take the entire box into your inventory. Previously the box’s Next Owner permissions ignored the items inside it, so the item in your inventory got Next Owner permissions of “CT”. Now, the item will get the correct Next Owner permissions of “C”.